Great friends are hard to find! And we are so very fortunate to be friends with the Vancouver Pen Club (VPC). It has come to our attention that the VPC is now famous (Pen World famous, to be more accurate)! The VPC is featured (I mean, check out this picture – they’re the headliners!) in the February 2011 issue of Pen World about pen clubs. The article mentions a number of other pen clubs too (alas, we were not, insert crying face :~)). We did, however, get mentioned by Glenn Marcus in his Pen Views (Thanks Glenn! I have also written to Glenn to advise him that we now meet at Williams on Wonderland)! We are happy to toot (or is that re-toot?) the VPC’s horn! Our pen-caps off to Maja and the rest of the gang. You’ve got a terrific club, keep it going! that “Pen World” chose our group shot for their lead photo in the article. It was my pleasure! It is nice to see a Canadian club, regardless of which one, get that “top billing”, especially in a US-based publication. It may be that it is because your group is so photogenic. Most Saturday mornings, our gang (or at least most of them) resemble a police line-up! :~) It is great fun to exchange and share ideas on how to make our clubs better for the members. Again, my personal congratulations to you for the extra effort that I know you put into your club and best wishes to all of the members of the VPC! Sorry about the London Pen Club not being included, but Pen World put together the list. Next time! No worries – my reference to a crying face as a result of our club’s inadvertent omission was meant purely in jest! 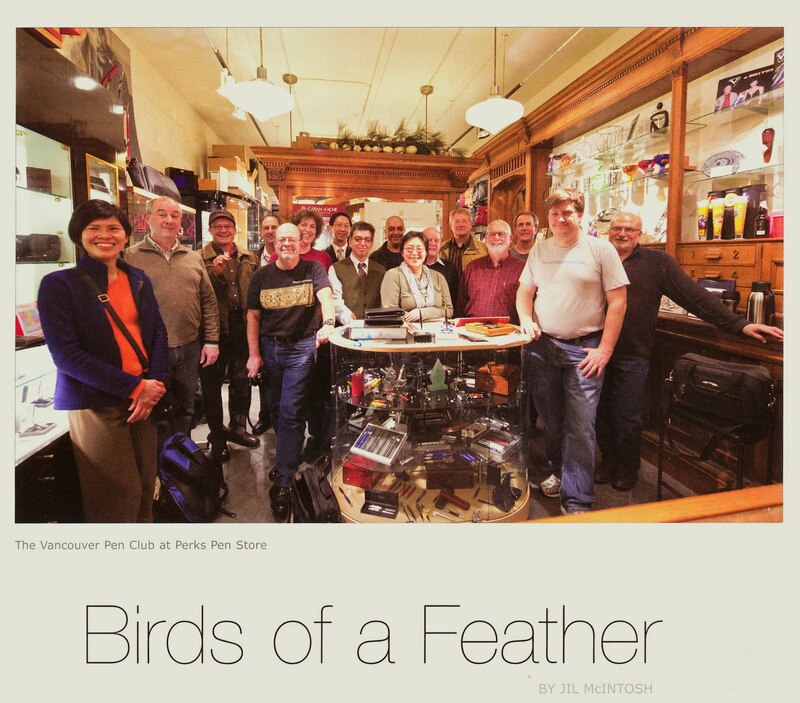 And thank you, Jil, for the excellent “Pen World” article you wrote; joining a pen club *is* a wonderful way to meet fellow pen enthusiasts and collectors!